How is the Ferry Commute from Bainbridge to Seattle? 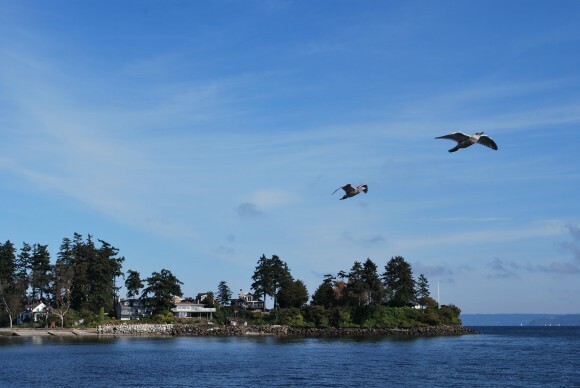 View of the Wing Point Neighborhood on Bainbridge from the Bainbridge Island Ferry. One question I get a lot from folks looking to move to Bainbridge is “how easy is the ferry commute from Bainbridge to Seattle?” We had that very same question before moving to Bainbridge and thanks to our friend Julie, who we were renting a cottage from, we got an insider’s day to day perspective on ferry commuting. We were happy that the costs, how long an actual commute takes, etc. were not a surprise to us after we had purchased our home. You will often hear that “Seattle is a 35 minute ferry ride from Bainbridge,” which is true, but that is dock to dock. In reality, door to door, at the very minimum is about an hour. But, even if your total commute is over an hour, 35 minutes will be on the ferry, where you can sleep, read, work, talk, drink, and unwind. Much different than the bumper to bumper traffic on I-5. To me, this is ideal. Our friend Shelly lives in Winslow and walks on the ferry each morning and then walks off and to work at Virginia Mason Hospital in Seattle. She has about a ten minute walk on the Bainbridge side (not counting a stop for coffee at the coffee kiosk) and about a fifteen minute walk on the Seattle side. All in all about an hour. This is one of the leanest, most economical commutes you can do. Your only cost is the walk-on pass. No parking, no bus fares, and great exercise. And yes, she does it year round and has been doing it for over ten years – and for many years with kids in tow who went to daycare on the Seattle side. My husband is one of the many bike commuters on the ferry each day. This too is one of the leaner commutes for time and money. Initially he did spend about $1000 on a new bike and gear, but that was quickly earned back on commute savings. We live in Winslow as well, which was a deliberate choice for us to be near the ferry on this side, given the fact that my husband’s office is ten miles off the ferry on the Seattle side. Being a bike commuter only costs $20 more a year than being a walk-on commuter. He leaves our house 15 minutes before the ferry departs and then has about a one hour bike ride on the other side, total time just shy of two hours. Now, with that said, his being a longer commute, he does not have to do it every day. He commutes to Seattle 3X a week and works on Bainbridge the other days. And yes, biking can be done most of the year. In the cold, icy season of Dec.-Feb. on some days, he does walk to the ferry and then take the bus on the other side. Not his preferred method because it does take longer, but on some days, it is just unsafe to bike. My husband’s commute is longer in time, but he also gets great excercise, something he does not have to worry about the rest of the week. 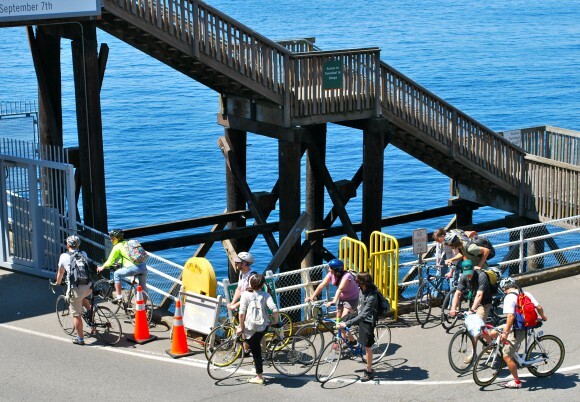 Cyclists getting on the Bainbridge Ferry, Seattle side in the summer. Our friend Mark lives out in Fort Ward and works in downtown Seattle. Fort Ward is on the extreme south end of the island, so he either gets a ride, takes the bus to the ferry or sometimes rides his bike. The majority of the time he takes the bus. To make the 6:20 am ferry, he would need to be on the 5:45 bus. However, this works for him because he only walks four blocks on the Seattle side, about ten minutes, so total commute time is an hour and five minutes. A monthly ORCA Bus Pass is also a great idea via Kitsap Transit. This is where the commute gets a little trickier. Our friend Tim lives in one of the in-town neighborhoods, but his job location changes from time to time based on projects and currently, he is in Kirkland. Since Kirkland is a haul, he keeps a car on the Seattle side. So, on the Bainbridge side he takes a bus or rides his bike then walks or rides to his car in Seattle. On the Seattle side, you can pay to park in a garage from about $200-350 a month. So, Tim’s commute costs are higher with parking on the Seattle side and his commute time is about an hour and a half, best case. Paying to park on the Bainbridge side is much more reasonable than parking in Seattle. Michael, one of my clients bought a house on the south end of the island as well. Luckily, he too works in downtown Seattle. To save some time, he drives to and parks at the ferry and then walks on. This adds about $100-125 to his monthly commute, but saves him about 10 minutes each way in time. So, his total commute time with a ten minute walk in Seattle is about an hour. Our friend Doug works in Bellevue. He does not need to go in everyday of the week, but on the days he does, he drives. Which means driving on and off the ferry. Getting a car on the ferry during peak times does require more time to ensure you actually get on the ferry. And, the cost is much higher as well. If you did this 2X a week it would cost over $200 a month, 4X a week would be double. However, if you require a car on both sides, this could be the most cost effective option, as there are no parking fees. In time, this is at least a 90 minute commute, best case scenario. There are of course other options like carpooling, keeping a bike at the Bike Barn at the ferry, riding a scooter or motorcycle, but the above are some of the more popular means of getting to work. In short, it is ideal if you live and work close to the docks on both sides, but if that can’t be controlled, living or working close to the dock on at least one side is the next best option. So, 90 minutes is a long commute yes, but the fact that a third of that is on the ferry makes all the difference in the world. 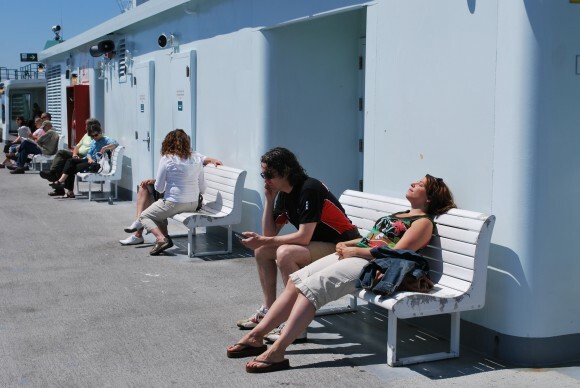 The time on the ferry is prime social time or down time for many folks. On the commute runs, you see people talking, playing games, reading, working on their laptops, listening to iPods, knitting, playing cards, paying bills, and drinking, yes drinking. In addition to food there is beer and wine on the ferry and yes, folks do partake. ”Having a drink after work” can be rolled into your commute home, which is just plain efficient. Folks getting home after a ferry ride certainly do not have the same blood pressure as those getting out of a car after 90 minutes on the freeway. So, please know that your commute is not going to be 35 minutes long, but the fact that you can live in a rural community and work in the big city via a one hour commute, sans driving, is pretty cool. A passenger enjoying the sun while commuting from Bainbridge Island to Seattle by ferry. the big thing to know is get a commuter pass. the pricing is reduced. my pricing below is as of February of 2017 and note fares are seasonal and highest in the summer. Cost to park at the ferry @$11 for 12 hours, $15 for 24 hours, $7 for evening. Credit cards now accepted. More info here. For more nuts and bolts, visit the WSF Bainbridge site. Get a first hand look at the ferry scene with the Ferry Web Cam.